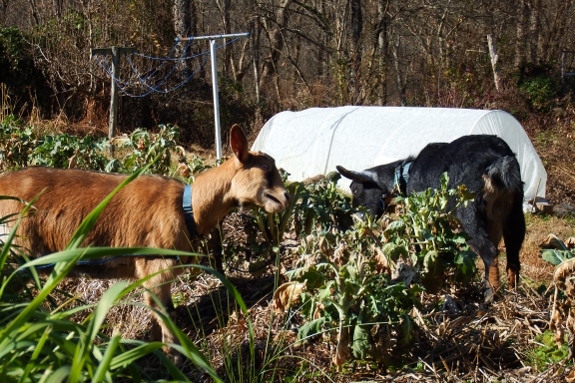 There's a fine line between letting the goats eat human-friendly produce and letting winter kill off the crops so badly even Artemesia turns up her dainty little nose. That sweet spot for broccoli appears to be after a couple of nights in the teens. The plants are droopy and no longer prime for our own consumption, but the girls still think they taste ten times better than oats and honeysuckle. I think I get the same amount of enjoyment out of watching our does dine as I get by eating vegetables myself.